A deposit equal to one night's accommodation is required to secure your booking. We accept Mastercard and Visa. Cancellations received less than 14 days prior to arrival, will incur loss of the deposit. A waiver may be made at the discretion of management if all or part of the accommodation period can be re-booked. Cancellations made more than 14 prior to arrival will receive a full refund, less a $20 processing fee. Gift vouchers for any nominated value are available for that special occasion, and can be organised over the phone. Please contact us. 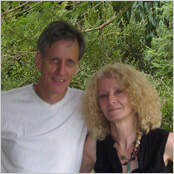 Russell and I have run our holiday cottages at Mount Glorious, just outside Brisbane, for fifteen years. We are living the dream, close to the city, yet a world away! At Turkey's Nest we have lots of repeat visitors, who come to enjoy the tranquility of the mountain, the bird life, the bush walks and the fresh mountain air. This is a family-owned and operated business. We love meeting our guests, and like to provide those little extras that make your stay special. We live on site, and while we will leave you in complete peace and privacy, we are always available should you need anything during your stay. Rose speaks reasonable French, and some German.